Why is Large Rabbit Accommodation Important? Your rabbit�s accommodation is its whole world. Your rabbit cannot hop on the bus to the gym for exercise, pop to the cinema when bored or visit the shops to pick out a new bed to sleep in. As a rabbit owner it is your responsibility to make sure that your rabbit�s accommodation meets all of its physical and mental needs. Osteoporosis (weak bones) which increases the risk of breaks to the legs and spinal injuries. Obesity, which itself causes other secondary problems such as sore hocks, an inability to groom properly and increased risk of flystrike. Muscle wastage, particularly in the hindquarters, which can affect a rabbit�s ability to hop normally and move around. This leads to the same possible complications as obesity. Heart problems; a lack of physical activity increases the risk of heart attacks. Abnormal, often repetitive, behaviour such as over grooming or chewing the cage bars. 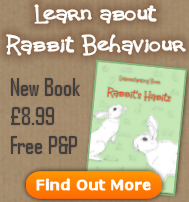 Destructive behaviour such as eating their enclosure, chewing wallpaper, or destroying their owner�s belongings. Apathy, spending all their time resting in one position and not interacting with their environment. These are signs your rabbit is slowly going crazy from being locked in a box with no mental stimulation. Good housing isn�t just about space to run around, it also gives you the space to add toys and activities to provide your rabbit with mental stimulation.